Seventeen-year-old Veronica 'Ronnie' Miller’s life was turned upside-down when her parents divorced and her father moved from New York City to Wilmington, North Carolina. Three years later, she remains angry and alienated from her parents, especially her father . . . until her mother decides it would be in everyone’s best interest if she spent the summer in Wilmington with him. Ronnie’s father, a former concert pianist and teacher, is living a quiet life in the beach town, immersed in creating a work of art that will become the centerpiece of a local church. The Last Song made me cry buckets! I mean I already know the story line (from the movie) although it wasn't really the same but yes, while the movie was enjoyable, the book was certainly much more. To me anyway. I really enjoyed it. From babysitting the turtle eggs to making the glass window to the relationship Ronnie had with the dad, the kid brother and of course with Will. 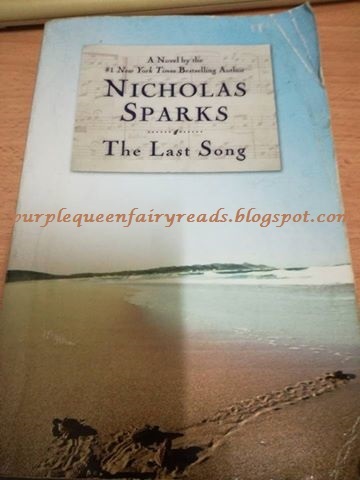 This is not the 'best' Nicholas Sparks in my category but it's close.